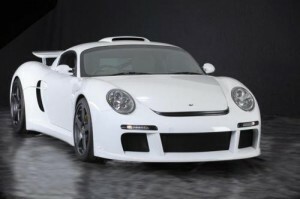 RUF CTR is a bespoke Porsche by the old German tuner for those who find the normal 911 a bit, boring! This supercar has now received a thorough upgrade for its new model to keep things fresh. The mid-engine design provides exceptional balance and agile handling, while the longer wheelbase provides better driving stability at high speeds. The body of the CTR 3 is a completely new development which is not based on any existing mid-engine concept. Engine-wise, the CTR 3’s twin-turbocharged 3.8 litre flat-six cylinder engine has an output of 750 HP at 7,100 rpm. The maximum torque is 708 ft/lbs at 4,000 rpm. This engine design combines a compact construction with high performance. Each turbocharger is provided with an intercooler which is placed in front of each rear wheel. The speed it goes is truly amazing! Acceleration from 0 to 100 km/h (62 mph) takes only 3.2 seconds, and its maximum speed is 380 km/h (236 mph). In terms of interior and safety, the car comes with the latest version of the famous RUF Integrated Roll Cage which is integrated into the A pillar and tube frame. The doors, with integrated side impact protection beams, and the front hood are made of aluminum. The body-shell is made of Kevlar-carbon composite.